Online Shopping in Dubai: Buy Digital Cameras and get free gifts with every purchase only at Menakart. 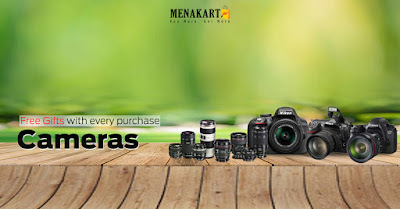 Buy Digital Cameras and get free gifts with every purchase only at Menakart. A camera is an optical instrument for recording or capturing images, which may be stored locally, transmitted to another location, or both. The images may be individual still photographs or sequences of images constituting video or movies. The camera is a remote sensing device as it senses subjects without physical contact.